10 years since its release. Based on this thinking, we have indevoured to give damaged hair a beautiful curl without using a treatment agent and achieved satisfactory hair straightening. Our thinking has not changed even though 10 years has passed since its release. 18 years have passed since we released our Cysteamine products. Wonder may be reborn many years later. Since the time when the status of a reducing agent called Cysteamine was not yet established, Orange Cosme has been seeking the possibility. Our conclusion is the Wonder. “WONDER the 3rd” is the current best answer as we continue to create the way as pioneers of cosmetics with confidence and pride.  The brand new “WONDER the 3rd” has the formulation of a Complex Reducing Agent as did the first generation. 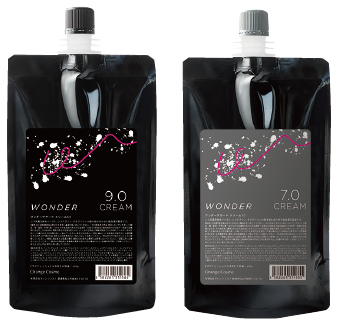 “WONDER the 3rd” aims to find how far we can pursue the merit of Cysteamine and Cysteine. Under the criteria of 7% or less thio conversion, which reducing agents should be combined? We needed some time to discover the basic combination. We take pride in the perfect balance created by spending that time. Solution 1 is a low odor treatment cationic lotion that balances the ridge feeling of Cysteamine and the texture of Cysteine by combining Cysteamine, Cysteine, Ammonium thioglycolate, and Acetylcysteine. These curling agents are easy to use and control damage by combining ceramide component and Meadowfoam oil. Furthermore, mixing makes it possible to deal with damage levels and control texture. Solution 2 has pH 5.8, a mildly acidic lotion of sodium bromate strength 8%, and a high penetration formulation of silicon emulsion. As the amphiphilic oil adapts to the hair, it aids penetration of the oxidizing agent (sodium bromate). Hair receives a good finish with moderate weight and softness by reacting with the repair effect of Solution 1. Solution 1 is composed of Cysteamine, Cysteine, ammonium thioglycolate, and acetylcysteine (7.0 only), and depends on the superior reducing power and texture of Cysteine that can be demonstrated even at low pH which is a major feature of Cysteamine. Even when hair is straightened, which can be quite damaging to hair, it combines strength to stretch with a hightened power to repair that can cope with damaged hair. A combination of ceramide, amodimethicone, and erucalactone minimizes damage to hair and improves growth to full satisfaction. As with liquid types, mixing solutions can deal with each level of damaged hair. Solution 2 leads to the recovery of hair’s hydrophobicity with a combination of erucalactone with the recovery effect of heat. The cream-type is blended with a deodorant since residual odor is a concern. Cysteamine forms waves with a ridge feel, and brings out a higher hair wave effect at a lower pH compared with thioglycolic acid and Cysteine. Basic treatment is important, such as washing carefully mid-treatment or applying Solution 2 firmly and completely because Cysteamine easily imparts a residual odor. Basic treatment is important, such as washing carefully mid-treatment or applying Solution 2 firmly and completely because Cysteamine easily imparts a residual odor. Basic treatment is important, such as washing carefully mid-treatment or applying Solution 2 firmly and completely because Cysteamine easily imparts a residual odor. Basic treatment is important, such as washing carefully mid-treatment or applying Solution 2 firmly and completely because Cysteamine easily imparts a residual odor. The common image of Cysteine is “friendly component to the hair,” “does not damage hair”, and has the feature that decreased hair strength is minimal while perms take firmly. This is the standard reducing agent to evaluate other reducing agents. This acid has a higher reducing power that creates elastic curls with a ridge feeling compared with Cysteine. NAC composes a highly moisture-rich and good texture curl despite the fact that its wave formative effect is slightly inferior to Cysteine. Blending with Cysteine creates the effect of making it difficult to cause precipitation or powdering (crystallization). Ceramide is the main component of intercellular lipids, which enhances the barrier function, increases water retention, and is essential for hair moisture. In addition, this ceramide repairs the CMC to give hair resilience and stiffness leading to a healthy condition. DGA (Diglucosyl Gallic Acid) arranges microfibrils, repairing inside damage to the hair and the cuticle at the same time and improves dryness and roughness by reproducing the cuticle’s outermost surface layer (F layer). Another feature is that the effect is sustained even with repeated shampooing. It prevents evaporation of moisture and moisturizes hair. It can be expected to repair hair whose surface was fuzzy and arrange it beautifully. These have a heat-resistant effect to protect hair from the heat of dryers and irons, to protect and repair the hair surface, and enhance and arrange the texture of its finish. In addition, a static electricity proofing effect is in these components, which provide natural luster and softness with the effect of high moisturizing and emollient effect. This cosmetic has the effect of repairing hair cuticle damaged due to aging, ultraviolet rays, heat of dryers, etc. It improves troubles such as contrarily wavy hair or tangling, leaves no stiffness and is easy to spread. It reacts with the amino group of the hair with applied heat with a hair dryer or hair iron and the effects last even after shampooing. This is the best way to respond to the demands of estheticians and customers. Wonder the 3rd can respond to various damage levels by combining (mixing) Solution 1 with another, such as a mixture of curl, cream, or curl and cream. Moreover, it can respond to various technical processes such as adjustment of texture, viscosity at the time of use, power and viscosity required by estheticians for medicinal solutions, texture adjustment according to each customer’s hair quality. mixing 9.2 and 7.0 can control the strength of the medicinal solution, and it is possible to form high-level curl and straightening. By mixing liquid type and cream type, it is possible to make any optional viscous medicinal solution with micro viscosity and high operability. Moreover, the conditioning effect improves. Controlling the power and the viscosity of the medicinal solution create a high quality finished shape and good condition. The strength and operability are flexible, extending design possibilities.